Stranded passengers who had been set to travel with Icelandic airline Wow Air are being forced to book new tickets and absorb unexpected costs after the airline shut down. 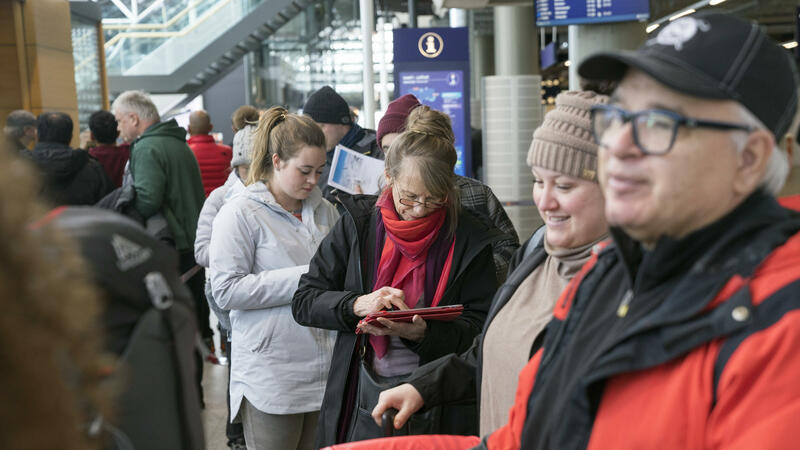 Here, travelers wait in line at Iceland's international airport on Thursday. Wow Air's sudden halt of all flights Thursday has caught travelers by surprise, sinking the airline's customers into frustration about their plans and sowing doubts about their ability to recoup travel expenses. The most intense turmoil hit Wow customers who are currently on trips, as well as those who were slated to fly late Wednesday and early Thursday. The airline's sudden shutdown created tense and odd scenes at airports. In one case, airline staff at the gate at Boston Logan International Airport informed customers of prolonged delays Wednesday night — only to eventually board the waiting aircraft themselves and shut the door. That description comes from Lindsay Branscombe, who relayed to NPR via Twitter messages the curious scene in which Wow customers watched as the jetliner they thought would take them to Reykjavik, Iceland, instead pulled away from the gate without them. Lindsay and her husband, Matthew, own and operate BSC Photo Studio in New Haven, Conn. On Wednesday night, Matthew was booked to fly from Boston to Belgium, with a stopover in Iceland, after their photography studio landed a commercial job in Europe. After Matthew arrived at the airport, "he was continually told the plane was delayed," Lindsay says. "Sometimes he was told it was due to bad weather, while the [airline's] delay emails said 'operational concerns.' "
As they waited at the terminal, passengers grew uneasy, she says, after seeing a nearby Icelandair jet back away from its gate and head toward the taxiway. "Wow Air continued to tell them it was simply a 'delayed flight' until around midnight," Lindsay says, "when the gate agents and flight crew actually got on the plane that was at the gate and the PLANE LEFT THE GATE with the passengers still unsure if the flight was cancelled!" It's not clear whether the plane took off for Reykjavik or simply taxied to another part of Logan, she added. But for would-be passengers, the damage was done. Instead of being told about possible replacement flights, the ticket holders were told they could pick up their luggage in the baggage claim area. "All our travel plans are now canceled, and we had to scramble to find a local photographer to do the job my husband was hired to do, because there was no way for him to get there in time," Lindsay says. She adds, "The most shocking aspect of this is that they were definitely selling those tickets right up until the end, because we bought our tickets only days before the flight." The couple had booked their tickets through Hopper — which announced on Thursday that it will reimburse "in full" all its users who bought Wow Air tickets. For those who are already in transit, the travel service says it will cover the full cost of rebooking airfare on other carriers. "Our team is currently getting in touch with our customers in transit via SMS and in-app push notification for more information," Hopper CEO and co-founder Frederic Lalonde said. "If you are one of the affected passengers, please look out for communication from our team so we can assist you." The Branscombes' photography company still faces losses from the hotel rooms they paid for. They were also forced to hire someone else to do the job for which Matthew had been hired. Wow's passengers say they're still vulnerable to losses from hotel bookings and other costs, even in cases where airlines are offering discount replacement flights. Banks and credit card companies can also help cancel payments, but that money can take a long time to reach customers. Similar sentiments are being voiced in Europe and North America — the two markets that Wow Air sought to join with its low-cost flights. Many Wow customers are now sharing stories and resources on a new Facebook page, titled Wow Air Customers. One of those Wow customers is Amber Joy Pingree-Felts, who said in the Facebook forum that she paid $1,400 to book tickets for two adults and one child on a Wow flight from Boston to Reykjavik for a trip scheduled for just after Memorial Day. Pingree-Felts says she has now filed a complaint with her bank, only to be told that her money likely can't be refunded until after the date of the now-canceled flight. "We will be able to file a theft-of-service charge once our takeoff flight date passes," she tells NPR. And while Icelandair is offering steeply reduced airfare to Wow customers who are stranded far from home, its offer requires proof of a current e-ticket on Wow — something some customers say they can't get, because the company has effectively shut down. "Icelandair would totally be a lifesaver," says Alison Fath, an American who was supposed to fly home from Paris this weekend. "However, since WOW collapsed, they aren't sending out any e-ticket info for our Sunday flight, which we can't send to Icelandair." Wow Air is also now dormant on Facebook, but that hasn't stopped customers from using its most recent posts to vent their frustrations. On the corporate page where Wow touts its tag line — "We aim to WOW!" — that phrase is being hijacked by people who comment on recent posts to say they "got WOW'ed" — meaning in this case that they feel abandoned, not amazed. An earlier version of this story mistakenly said Matthew Branscombe's flight was Thursday night. It was actually Wednesday night.